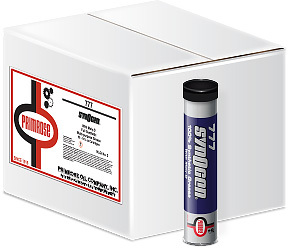 Syn-O-Gen® 777 is a 100% pure synthetic industrial grade grease for wide-range multi-purpose applications. Wide-range applications include not only wide temperature ranges but also a wide range of performance and environmental applications. Syn-O-Gen®'s advantages over mineral oil based greases are unmistakable. Performance, versatility, equipment protection, and cost savings are the hallmarks of this superior grease.